3 Bedroom Detached House For Sale in Preston for Asking Price £525,000. 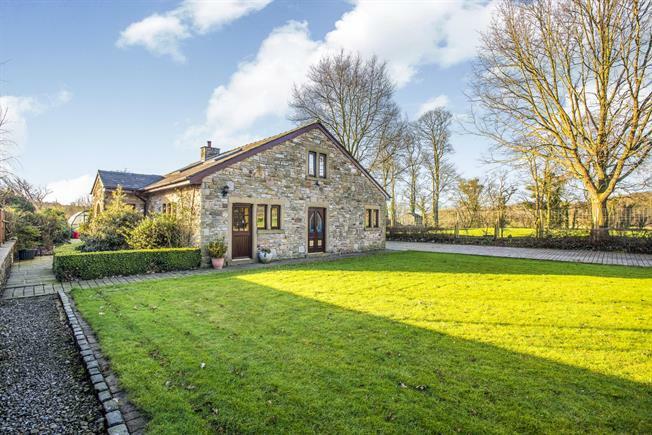 An opportunity has arisen to purchase an exceptional and individually designed detached stone barn conversion, simply surrounded by breathtaking grounds, running alongside the River Ribble. Here is a home that exemplifies the very nature and prestige of Alston, having been cherished and cared for by the same family for numerous years. The attention to detail at every step can be seen in every room with each room flowing effortlessly to the next. This established home demonstrates character being a unique barn with original features including stone feature and exposed brick walls vaulted beam ceilings whilst also having the abundance of additional reclaimed features. You are welcomed to the home via a stylish entrance door into a charming reception hallway with a vaulted beam ceiling and an open spindle staircase leading to the first floor. The lounge adjoins the reception hallway with open aspects view overlooking the River Ribble providing access via some large French doors plus a wood burning stove with an exposed brick surround giving a real oldie worl aspect to the room. There is also a study/snug which is a perfect place for day to day living or relaxing. The large breakfast kitchen provides a great family living space and has a host of integrated appliances. The ground floor also comprises of a bedroom and shower room facilities. Upstairs including two generously proportioned double bedrooms both benefitting from en-suite shower rooms. Outside, set in one of the most envious plots you will find incredibly private surrounded grounds accessed via a hardwood timber gate with block paved parking available for multiple vehicles leading to a detached double garage, beautiful landscaped gardens, a large shed and a path down to the most stunning River Ribble. Half of the River Ribble belongs to the grounds of this property also giving access for fishing rights. Viewing is essential to appreciate the accommodation on offer. A stylish panelled entrance door. Double glazed window facing the front. Radiator, carpeted flooring. Open spindle staircase leading to the first floor. Vaulted beam ceiling. Several double glazed full length windows facing the side and rear. Double glazed French doors opening onto spectacular grounds. Radiator, carpeted flooring. Feature wood burning stove and exposed brick surround. Two double glazed windows facing the front and side. Double glazed door opening onto the spectacular grounds. Tiled flooring, tiled splashbacks. Radiator. A range of farmhouse stylish fitted wall and base units, sink with mixer tap and drainer, space for a range cooker, integrated dishwasher, fridge/freezer. Tiled flooring, tiled splashbacks. A range of base units. Plumbed for a washing machine and dryer. Double glazed frosted window facing the rear. Tiled walls, tiled flooring. Low level WC, pedestal sink, single corner shower cubicle. Double glazed velux window. Tiled walls and tiled flooring. Low level WC, pedestal sink. Single enclosure corner shower unit. Four piece bathroom suite; Tiled flooring and tiled walls. Low level WC, pedestal sink, tiled bath with mixer tap, single enclosure shower cubicle. Double glazed velux window. Double garage; Electric up and over door. Power sockets and lighting.